Joseph Capelli's trip across the war torn, alien occupied America in Resistance 3 will make a stop in Mt. Pleasant, Pennsylvania where Chimeran forces will hunt him down. Here, Capelli will be pursued by the spotlights and the near-invisible snipers of that alien force. The Chimera have deployed a new threat in the third Resistance game, the Sniper Hybrid, and yes, he can fire while cloaked. If you hated the cloaking Chameleons of Resistance 2, get ready to hate the Chimera even more deeply. Insomniac Games showcased the new, previously unseen Mt. Pleasant level at an event in Hollywood this week, a dark and forested level populated by Sniper Hybrids. Unlike previously revealed locations, the town of Haven—under heavy assault from the Chimera—and the flooded Wrightsburg, Missouri, Capelli is on his own at this point, which Insomniac says occurs about halfway through Resistance 3. We watched as Insomniac played through the Mt. Pleasant level, with Capelli creeping through its woods, armed with the new Deadeye sniper rifle. In the distance were hints of Chimeran Sniper Hybrids, only visible by their laser sights which scanned the trees for hints of humans. A Chimeran ship hovered overhead, blazing the land with a powerful spotlight that looked alarmingly real. The Sniper Hybrids were equipped with Deadeyes too, sometimes obscuring Capelli's vision with the blinding light of their laser scopes. Capelli, controlled by the level designer responsible for Mt. Pleasant, picked off Chimeran soldiers with the Deadeye when he could pinpoint their location, switching to the heat-signature detecting Auger rifle when he couldn't. The Deadeye, like all Resistance weaponry, had two modes of fire, with a regular sniper round and a charged shot for extra variety. After dispatching the Sniper Hybrids hiding in the forest, we saw another new enemy unique to Resistance 3. The Shield Drone is another hybrid that can provide an energy shield to his fellow Chimeran soldiers, painting them with protective energy. He's similar in style to a Medic from Resistance 2 or Team Fortress 2, acting as a support unit. Following Insomniac's hands-off demonstration of Mt. Pleasant, we got to play the game again for ourselves, experiencing the boat ride level previously showcased at the company's recent Community Day. It's a level that offers an intense feeling of dread as you slowly creep through a varied Chimeran force made of Longlegs, Grims and Shock Drones. It's stark, injected with set pieces—like the towering Goliaths that threaten to crush your small craft—and challenging. Perhaps I've just grown accustomed to regenerating health, but even on normal difficulty, the Chimera put up quite a fight. We also got a chance to look at multiplayer—my first time with the 16-player mode—and a new map set in Colombia. This is an open trainyard, a map better suited to sniping and hiding than the previously revealed Fort Lamy set in the Republic of Chad, Africa. Resistance 3's multiplayer shows some fairly obvious Call of Duty: Modern Warfare influence, with new abilities and perks, borrowing some "best in class" ideas while still managing to feel unique. 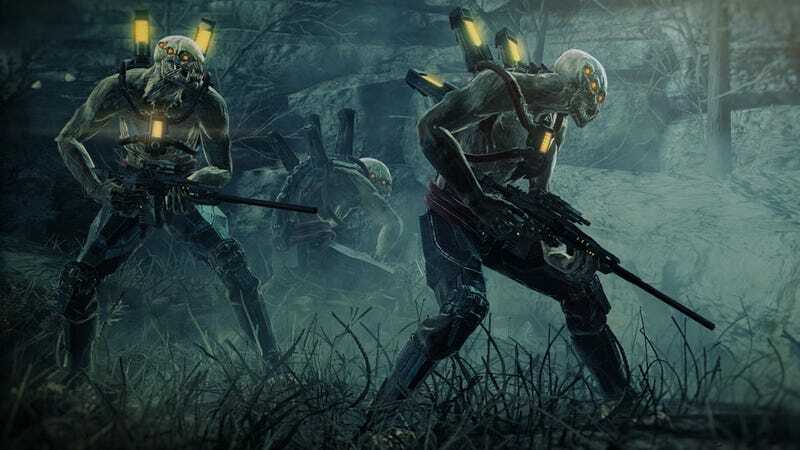 Part of what makes Resistance 3's online mode feel different from its peers and predecessors may be its use of skills like the Doppelganger, which projects a near-perfect clone of your character just a few feet away. Your opponents often have a hard time figuring out which you to fire at first. Or the Lightning Shield, a protective ability that deters melee attacks, and Cloak, which makes you all but invisible until you start firing. The Spotter ability will bring up a red overlay that, should it detect an enemy, keep them visible after they've left your line of sight. Resistance 3 multiplayer offers at least four stock classes—Survivor, Infected, Specter, Warden—each with their own unique loadouts and skills. The most memorable of those four was the Infected, with its Leaper Corpse ability. Kill an enemy and you can spawn a pair of Leapers from their body, a nuisance for your enemies. Four custom classes can also be created and customized. Most of it feels comfortable, a bit familiar, but still a hell of a lot of fun. If you're a Resistance fan, you're probably going to like the changes that Insomniac is bringing to the series this time. The return of the weapon wheel is welcome and multiplayer battles, at least from what we played of Death Match, were instantly addictive. Resistance 3 is due to hit the PlayStation 3 this September in North America.